In an attempt to continue to reach the online youth, Airtel keeps driving its initiatives on the web through Facebook applications. After a recent execution for F1, the latest from them is ‘Tera Mera Friendship Band’ application which is a topical execution in the run-up to Friendship Day. This one seems like a great viral idea! 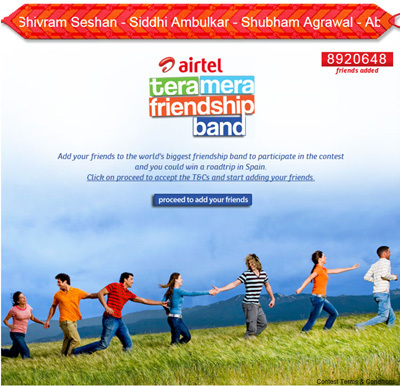 Users can login to the application and select friends that they want to add to the world’s longest friendship band. The application claims to already have 8.9million friends on it – obviously not a unique number but big nonetheless. This is coupled with a usual contest with a ‘Road trip to Spain’ as gratification. What could be more clichéd! The execution also leaves a lot to be desired. The longest friendship band exists in imagination, there is no visual representation for it, except a header ticker with names. Media placements on Facebook and Youtube and driving users to this application.